Edited from the sources by Michael Kube and Jochen Reutter. Fingerings : B�la Bart�k. Notes on Study and Interpretation by Peter Roggenkamp. 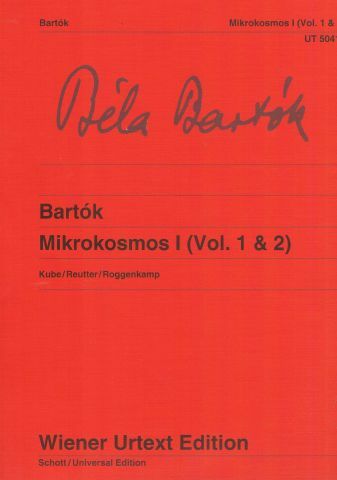 B�la Bart�k's Mikrokosmos is one of the key works of 20th-century piano music. The repertoire comprises educational pieces 'from the very first beginning' as well as concert literature, thus making this work an indispensable companion to piano lessons. The work is now available for the first time as urtext edition in three volumes, with each volume containing two of the six volumes of the original edition. The musical text was critically examined on the basis of the sources and could be corrected in many details. Furthermore, the edition contains some previously unpublished pieces and early versions. Educationally very revealing are the versions of several pieces which Bart�k arranged specially for the lessons of his son Peter and which are printed in the appendix of the volumes. The edition is completed by notes on study and interpretation based on the sources and a glossary of unusual expression markings.